This most interesting surname of topographcial or locational origin derives from the Old English words 'healf' plus 'hid' meaning literally half of a hide. As such they give us a fascinating glimpse into the Old English world and its social customs. A hide was a land measure generally equal to one hundred acres but in which the size of an acre could be variable. The hide was regarded as the amount of land ploughed by one plough and eight oxen and adequate for the maintenance of one free family for a year. Placenames sometimes incorporate the elements 'healf', 'hid' as at Half hyde (Hertfordshire) and Halfhides in Essex where a residence on half a hide was probably situated. 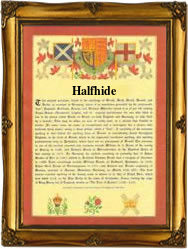 The surname Halfhide occurs under the variant forms of Halfhead and Halfhyde. One Margaret Halfhide married John Clarke at Saffron Walden Essex on August 4th 1604. Phillipp Halfhide married Elizabeth (name of spouse not recorded) on November 21st at St. Stephan, Coleman Street, London. The first recorded spelling of the family name is shown to be that of Robert de Halvehid, which was dated 1212, in the Curia Regis Rolls, Hertfordshire, during the reign of King John, known as 'Lackland', 1199 - 1216. Surnames became necessary when governments introduced personal taxation. In England this was known as Poll Tax. Throughout the centuries, surnames in every country have continued to "develop" often leading to astonishing variants of the original spelling.